“To believe in traditional Christianity is something else,” Scalia said. “For the son of God to be born of a virgin? I mean, really. To believe that he rose from the dead and bodily ascended into heaven? How utterly ridiculous. To believe in miracles? Or that those who obey God will rise from the dead and those who do not will burn in hell? The outspoken conservative justice—known for his views on religion in America—didn’t shy from them during his visit to south Louisiana Saturday. He didn’t discuss any specific issues before the high court, but did tell those in attendance they had “no greater model” for their faith than St. Thomas More. The Catholic martyr and considered the patron saint of lawyers, repudiated Martin Luther and refused to endorse King Henry VIII’s plan to divorce Katherine of Aragon or recognize the king as the supreme head of the Church of England. More was found guilty of treason and beheaded in 1535. “I find it hard to understand people who revere Thomas More but who themselves selectively oppose the teachings of the pope,” said Scalia, widely cited as a potential nominee for the position of chief justice when William Rehnquist leaves the bench. 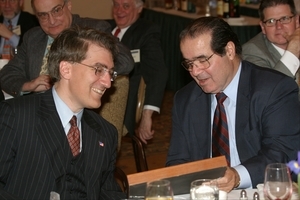 Photo: Justice Scalia admires an icon of Elijah the Prophet presented to senior editor Robert P. George at a Touchstone-sponsored dinner in Washington D.C. on May 3rd of last year honoring Dr. George for his achievement in service to the nation and the church (click on the image for enlargement).